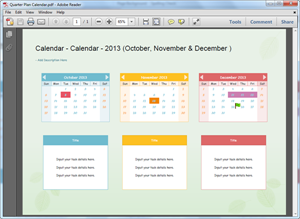 Edraw offers you a number of ready-made calendar templates which you can use in your drawing and free. Edraw is used as a calendar software coming with ready-made calendar templates that make it easy for anyone to create beautiful calendar. The calendar templates are easy to use and free. Edraw is completely integrated with MS Office so the templates can be converted to Word, Excel, PPT formats with a single click. 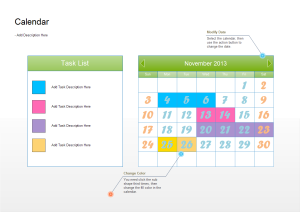 Edraw makes it easy to build clear and interactive calendars from the built-in templates. It only takes a few minutes to choose a basic template, insert event bars, and add the finishing touches. 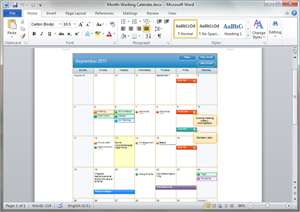 If you want to use a ready made template, go to calendar templates page and choose the Calendar that best suits you. When you finish creating your calendar in Edraw, one click on the Export button will transfer your drawing into MS PowerPoint presentation without clarity loss. You can make calendars of the best quality and with the least effort. Customizing a template requires the help of Edraw software. Click the download button and install Edraw, then you will enjoy endless benefits. All templates in the software gallery windows are easily in changing color, theme and effect. All are simple, only clicking on the Export PDF button will convert your calendar template into PDF, which greatly shortens your time and increase work efficiency. You can view the PDF Calendar Template to view the quality. 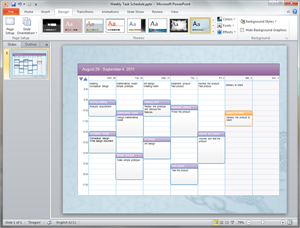 Discover why Edraw is an excellent program to create calendar. Try Edraw FREE.